The information, including but not limited to, text, graphics, images and other material, contained on this website is for educational purposes only. The content is not intended in any way as a substitute for professional medical advice, diagnosis or treatment. Always seek the advice of your physician or another qualified healthcare provider with any questions you may have regarding a medical condition or treatment and before undertaking a new health care regimen, and never disregard professional medical advice or delay in seeking it because of something you have read on this website. 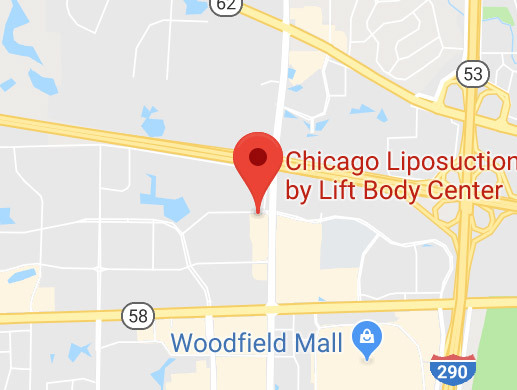 Chicago Liposuction by Lift Body Center and Dr. Rosett assume no liability or responsibility whatsoever of any kind for the content or materials contained in the website, or for any diagnosis or treatment made in reliance thereon. Chicago Liposuction by Lift Body Center and Dr. Rosett make no representations or warranties regarding the accuracy, integrity or quality of the linked sites on this website. Chicago Liposuction by Lift Body Center and Dr. Rosett are not liable for any direct, indirect, incidental, special, consequential, or punitive loss or damage that result from the use of this website, the use of linked sites, or the material in this website. Causes of being overweight or obese vary from person to person. Whether genetic or environmental, it should be noted that food intake, rates of metabolism and levels of exercise and physical exertion vary from person to person. This means any procedure results will also vary from person to person. No individual result should be seen as typical.